1. Season One: Episode 7, "Andy The Matchmaker"
The first of many episodes where Knotts impulsively quits the Mayberry police force includes a sequence where the deputy curtly lists off the state-supplied equipment he's returning ("One whistle… I replaced the pea"), then speculates on what he might do for a living now. "I can go to the pickle factory," Knotts says. "They always need a brine tester." 2. Season One: Episode 14, "The Horse Trader"
Knotts tells Griffith that when the town council holds their vote on what to do about the old cannon, he's definitely going to vote to keep it. "You don't like change, do you?" Griffith asks. "No I don't," Knotts replies. "You know when they put that stamp machine in the post office? That just frosted me!" 3. Season One: Episode 18, "Andy The Marriage Counselor"
Knotts demonstrates to Griffith what he's learned about the practice of judo, urging him, "Come right at me, you won't hurt me. It doesn't matter how strong you are, because it's leverage." When Griffith charges Knotts and puts him in a headlock, Knotts croaks, "Nope, nope… you did something wrong." 4. Season Two: Episode 19, "A Medal For Opie"
Knotts bemoans his paltry paychecks, complaining that when he took his girl to a Chinese restaurant in Mount Pilot, he didn't have enough money to leave a tip. Knotts: The waiter called me something in Chinese, and it didn't sound like "sport," neither. Griffith: You're going to have to stay out of those high-priced restaurants, I guess. Knotts: It wasn't high-priced. Only $2.75. Knotts: Well, that's the family dinner for one. 5. Season Three: Episode 2, "Andy's Rich Girlfriend"
Knotts notes his and Griffith's lifelong friendship ("I ran second to your first in the county penmanship contest"), by way of warning him that it's probably not going to work out with his wealthy girlfriend. "The rich are different. You ever see a rich kid's bicycle? Solid chromium, with at least six or seven red reflectors." 6. Season Three: Episode 13, "The Bank Job"
After reading an article about how crime in small towns can be attributed to "a-path-y," Knotts makes the case against Mayberry's lax security. Knott: A) Earl Johnson left his key in the car all night. Griffith: That key broke off in there last spring. Knotts: B) No nightlight in the office of the Mayberry Ice House. Griffith: The light keeps the watchman awake. Griffith waves Knotts off, complaining that Knotts is just worked up because he saw Glen Ford in G-Men: "Now you're going to Glen Ford it all over town." 7. Season Three: Episode 16, "Man In A Hurry"
Knotts and Griffith specialized in long, pause-filled exchanges about what they might do—a shtick originated in this classic episode about a businessman whose car breaks down in Mayberry. While the businessman paces impatiently on Griffith's porch, Knotts drawls, "You know what I think I'm going to do? I'm going to go home, have me a little nap, and then go on over to Thelma Lou's and watch a little TV. Yeah, I believe that's what I'll do. Home. A nap. Then over to Thelma Lou's for TV. Yep, that's the plan. Home. Little nap…"
8. Season Three: Episode 19, "Class Reunion"
It rarely makes the list of the greatest Andy Griffith Show episodes, but the first seven minutes of "Class Reunion" should be issued to anyone who wants to learn how to write Southern characters, and how to act them. Beginning with Knotts and Griffith moving a heavy trunk and worrying that one of their pants might've ripped ("You're all clear. How about me?" "10-4. "), the conversation evolves into a discussion of those "make money in your spare time" ads, and then a conversation about what's in Knotts' trunk, starting with a rock ("my daddy's rock") that Knotts used to strike a match on to light his father's pipe. Then Griffith finds their old yearbook, which he himself no longer has because "Aunt Bee gave it away to a disease drive," and they begin talking about the club that Griffith was in but that Knotts wasn't, because "Jack Egbert didn't like you." Griffith looks at Knotts' yearbook picture—"I was painfully thin then. I got my mother's family's frame. When I was 17, I could reach into a milk bottle and pull out an egg. "—and then he looks over Knotts' list of high-school achievements, including "board of directors of the tin-foil drive" and "volleyball court maintenance crew." After all that, Knotts mutters, "You know, Jack Egbert was no prize." 9. Season Three: Episode 21, "Opie And The Spoiled Kid"
Probably the most famous child-rearing conversation between Knotts and Griffith happens in Season Three, Episode 14, when Knotts explains, "You read any book you want on the subject of child discipline, and you'll find that every one of them is in favor of bud-nipping." But this episode contains a more involved talk, starting when Knotts insists, "Not being emotionally involved with the child, I think I can be more objective." Griffith: You've been at the magazine section of the Sunday paper again, haven't you? Knotts: I skimmed through it. 10. Season Three: Episode 27, "Barney's First Car"
While waiting for his new used car to arrive, Knotts tells Griffith, "This is about the biggest thing I ever bought." Griffith: It's a major step. Knotts: The last big thing I bought was my mom's and dad's anniversary present. Griffith: What'd you get 'em? Knotts: Well, they're really hard to buy for. Besides, it was something they could use. They were really thrilled. Two tons of concrete, all steel-reinforced. Griffith: You're a fine son, Barn. 11. Season Three: Episode 30, "Dogs, Dogs, Dogs"
In a tour-de-force monologue, too long and performance-driven to reproduce in full, Knotts tries to reassure Griffith's son Ron Howard that the stray dogs he just dropped off in a farmer's field will be okay, even in a thunderstorm. "A dog can't get struck by lightning. You know why? Because he's too close to the ground. See, lightning strikes tall things. Now, if they was giraffes out there in that field, well then, we'd be in trouble." 12. Season Four: Episode 4, "The Sermon For Today"
After sleeping through the visiting preacher's sermon about the restless pace of modern life, Knotts compliments him in front of the church, saying, "That's one subject you just can't talk enough about. Sin." 13. Season Four: Episode 10, "Up In Barney's Room"
Knotts gives Griffith a tour of his boarding-house room and offers him some spicy homemade chili, which Griffith declines because "It makes my head all wet." Later, Knotts shows off his décor. "See those shelves? Orange crate. See on the side where it says 'oranges'? That's the only way you'd ever know." 14. Season Four: Episode 15, "Aunt Bee The Crusader"
A local chicken farmer protests the county's decision to build a road through his property, and when he gets the townsfolk on his side by giving them presents, Knotts tells Griffith, "We could book him on a 204." Knotts: Bribery, collusion, and/or tampering with a material witness. Knotts: It's kind of a catchall. 15. Season Four: Episode 16, "Barney's Sidecar"
Griffith makes fun of Knotts' motorcycle get-up by grabbing Knotts' oversized helmet and slapping it on his own head. A mortified Knotts creaks, "Don't wear my hat, Ange. I can't stand to wear a hat after it's been on someone else's head. My mother was the same way." "I remember that about your mother." 16. Season Four: Episode 27, "Fun Girls"
Knotts admits that he's been repairing some torn items around the courthouse by using sewing skills he picked up from his mother, and further admits his plan to knit Griffith an afghan for Christmas, in the state colors, with "Home Sweet Home" in the middle: "You know, knitters and crocheters never have stomach disorders." 17. Season Five: Episode 2, "Barney's Physical"
Knotts is in high dudgeon because Griffith is pretending not to remember what happened five years ago on that day. Griffith: You met Thelma Lou? Knotts: No, that was in 1960 at Wilton Blair's funeral. Griffith: You moved into Miss Mendelbright's boarding house. Griffith: As far as I can figure, those are the high spots. 18. Season Five: Episode 4, "The Education Of Ernest T. Bass"
Although best remembered for Griffith's quick reply to Knotts' request to be allowed to work over a prisoner ("He'd kill ya. "), this episode begins with a classic pointless exchange, regarding whether they're going to go to the diner for lunch. Knotts is opposed: "I checked the special. Chicken wings, rice, and mixed vegetables." Griffith: That doesn't sound bad. Knotts: You know what she does. She give you two wings, and usually from a chicken that's done a lot of flyin'. What you wind up payin' for is the rice and mixed vegetables. That's what it boils down to. Might as well face it. 19. Season Five: Episode 23, "TV Or Not TV"
Knotts explains to Griffith his idea for a TV show about their lives, starting with an episode in which Knotts' character tracks bank robbers while Griffith's is out of town. ("We do a nice warm scene with you in a restaurant.") Then, while Knotts' character stops the crime, Griffith's gets "a virus infection, and you're in bed, and Aunt Bee's bringing you chicken soup… lot of heart." When Griffith expresses skepticism about his character's role in the drama, Knotts replies, "Have you ever seen a virus scene properly played? It'd be the high spot of the picture." 20. 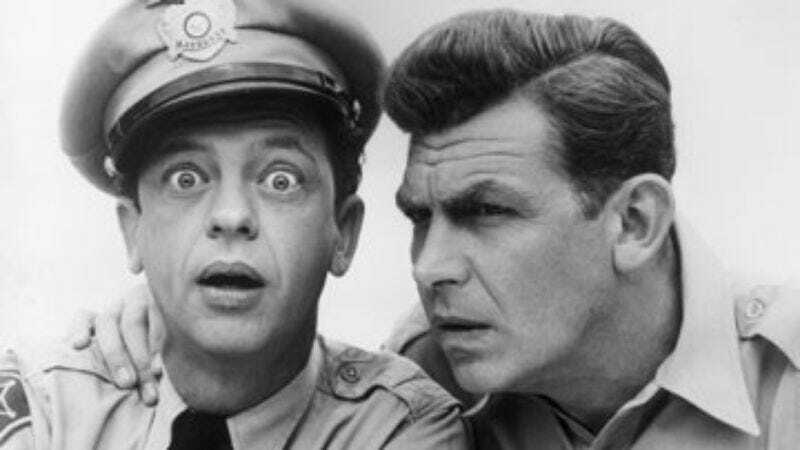 Season Five: Episode 27, "Aunt Bee's Invisible Beau"
When Griffith tells Knotts that his aunt has been dating a "butter-and-egg man," Knotts quips, "He buttered her up and she egged him on." Griffith: That's funny! You just think of that? Knotts: I can't take any credit for it. My mind just works that way.